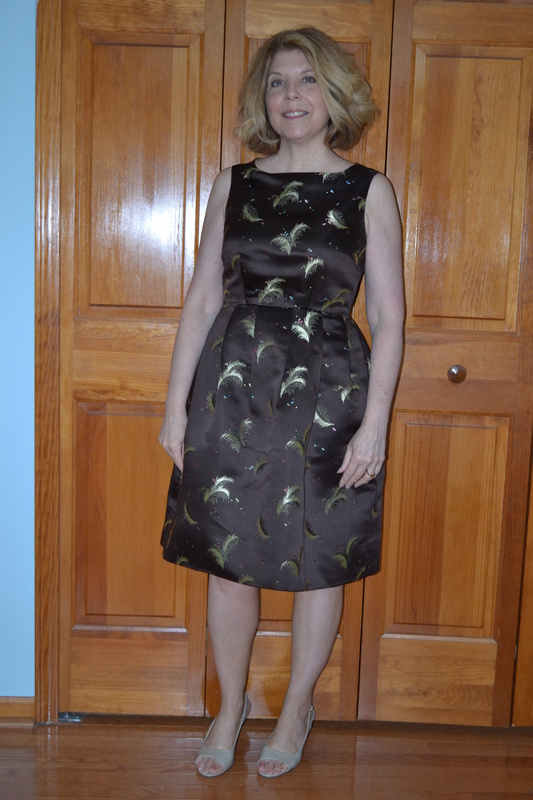 In Spring of 2013 my mother-in-law gave me a maternity outfit she had made in 1963. No, I’m not pregnant, after seeing some of the garments I had made, she thought I could take it apart to make something new. I was flattered and a bit intimidated, it took me almost a year to finally start. 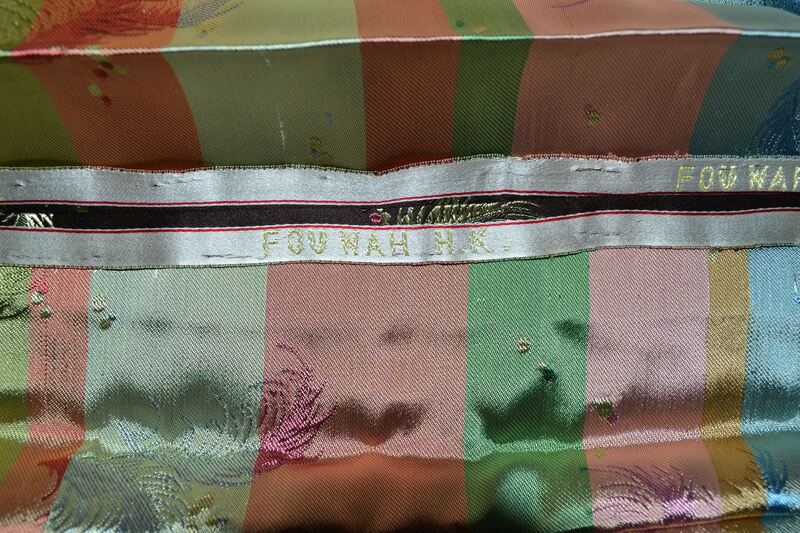 The fabric is a beautiful silk purchased in Hong Kong by my husband’s uncle, Dr. Tom Dooley, in 1958. Sadly, Uncle Tom passed away in 1961. 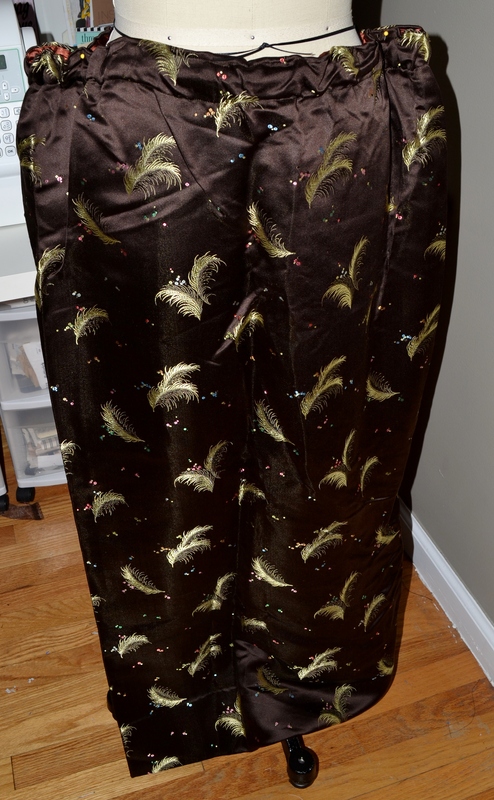 It was not until 1963, while pregnant with her 7th child, my mother in law had it made into a long skirt and top to wear to the annual Christmas Gala at the Detroit Golf Club. Unfortunately she does not know much about the dressmaker, just someone working in a Detroit tailor shop, and I’m convinced that dressmaker was a genius. What looks like a simple top and skirt is an amazing feat of engineering. I’m sure the term zero waste fashion did not exist in 1963, but this is an incredible use of almost every inch of the fabric. It was painful to take it apart, but it would be such a shame to let this beautiful fabric just sit in a box. The top appears almost like an envelope, it can lie flat, but in exploring it, you find folds which can open like a pleat in some areas, allowing for an expanding belly. 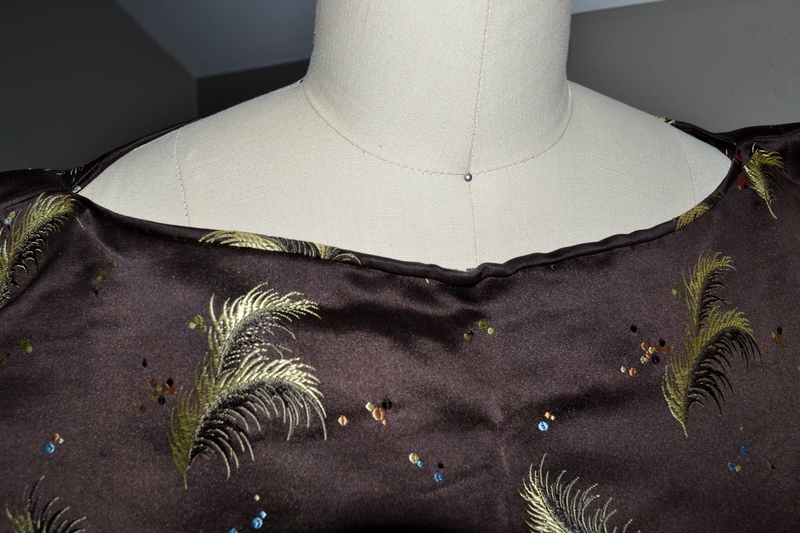 The neckline appeared to have piping as a finish, but appearances can be deceiving. 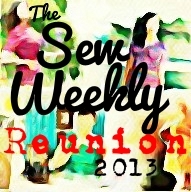 The fabric had been folded over and stitched, with a satin ribbon facing. What appeared to be piping was actually part of the whole piece of fabric. 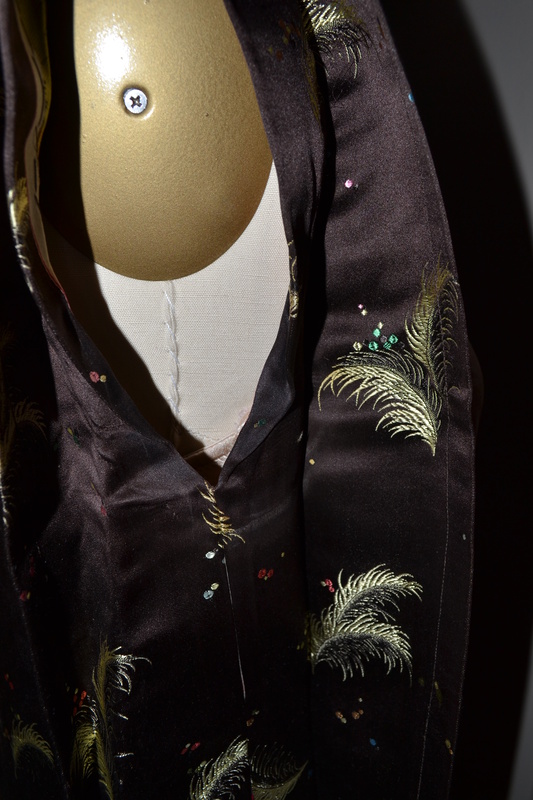 When taking completely apart, it became obvious, the only piece cut out of the fabric was what was likely trimmed away to allow the curve of the neckline to lie smoothly. Here is the piece from the front of the top, after all stitching was removed and showing the only cut area. The stripe is the back side of the fabric, which my mother in law said was her favorite part. 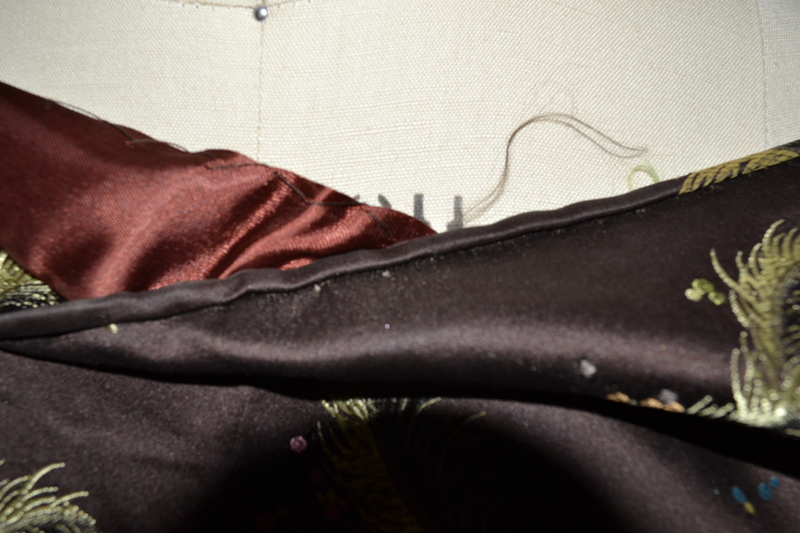 Detail of one of the pleats expanded. The side seams and armscye facing show the selvage. 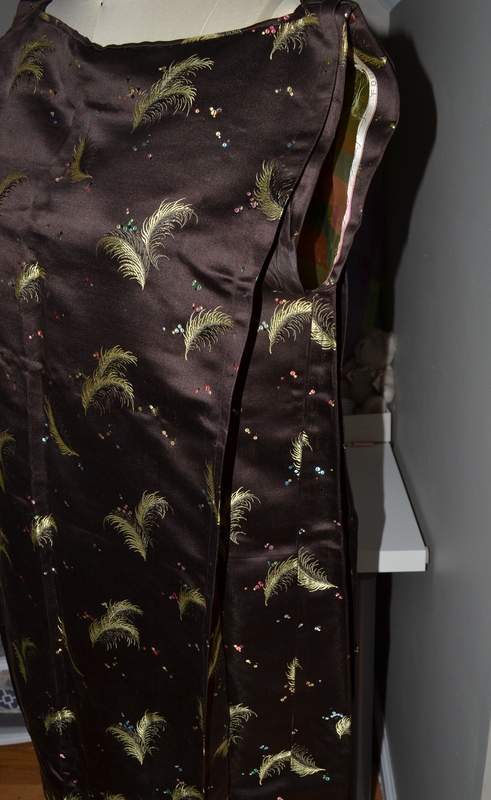 The full length skirt looked to be a simple, elastic waist straight evening skirt. But it was also carefully engineered with the expandable pleating. 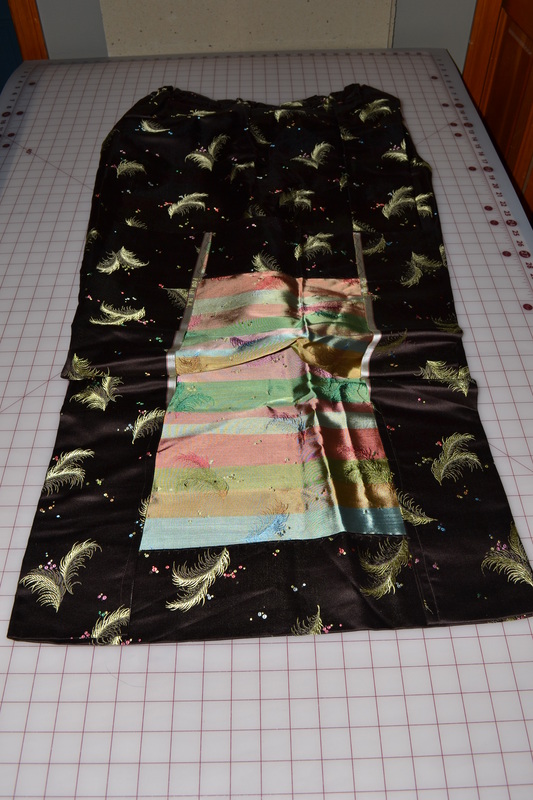 Looking inside the skirt shows how every inch of fabric was used, selvage to selvage. 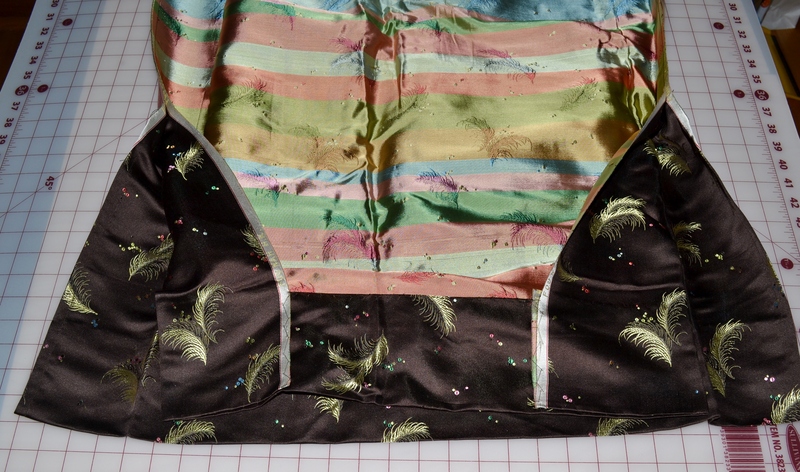 The inside front of the skirt was stitched down at the hem for ease of walking. A deceptively simple garment, still in wonderful condition after more than 50 years. After taking it apart, there was 4 pieces of yardage. 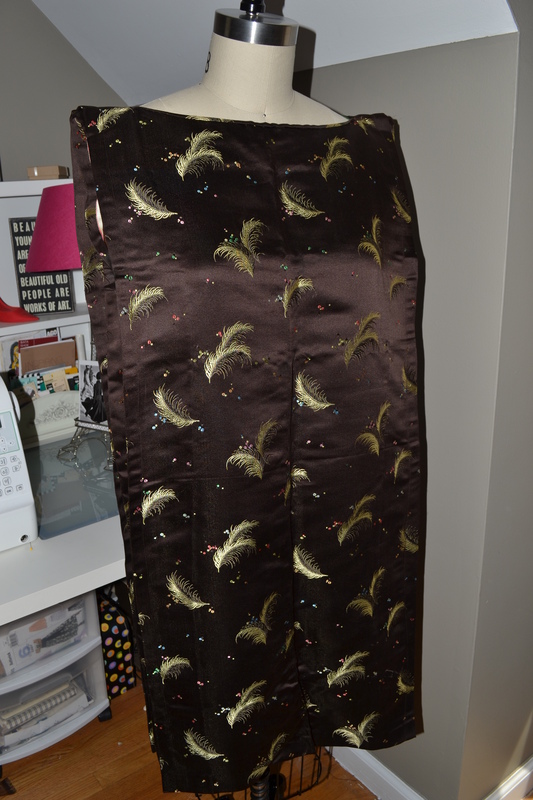 So far I have only used the fabric from the skirt, making a dress to wear to the 50th birthday party for my husband’s brother, who was in utero when my mother in law wore the original garment. 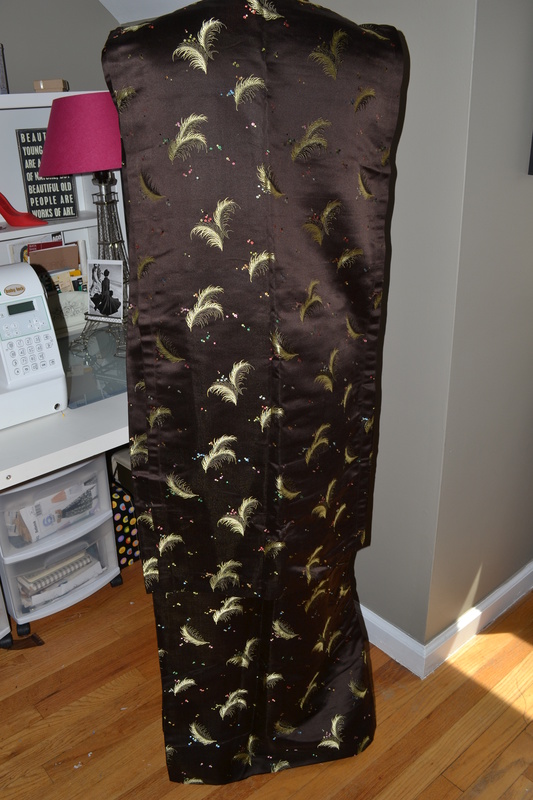 Someday the rest of the fabric will become a jacket, but for one night, I was the favorite daughter in law. Oh wow. 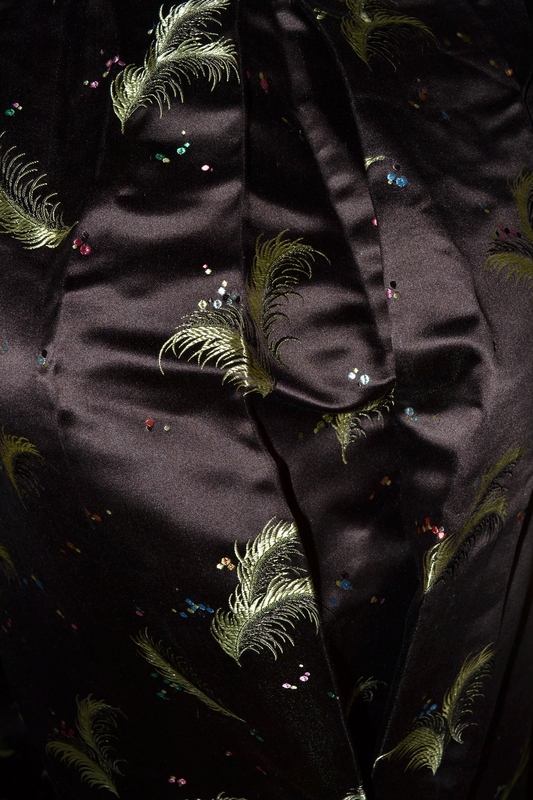 This is absolutely beautiful fabric . You have made it into a beautiful dress with such a great history! It is certainly a lovely colour on you too. I like how it made you the favourite d-in-law! Made me laugh! Thanks, my sister in laws have a friendly competition going and are much better at it than I am. Really? I think you are extremely fantastic at sewing! I bet they say the same about you! Wow, I can’t believe you turned it into that dress! It is lovely! 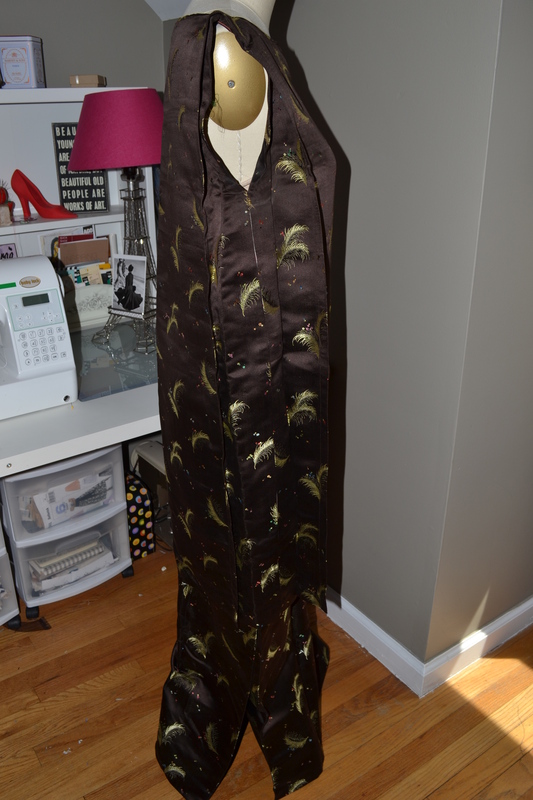 Thanks, the pictures don’t really show the depth of color in the fabric. It is unlike anything I have ever seen. What a lovely story. A very smart dressmaker knew this fabric must be cut to be used again. Your new dress is beautiful and I am sure your MIL is so pleased. Thanks, I really wish I could find out more on the dress maker. She was ahead of her time. What a great story! You’ve made a beautiful dress as well. How could you not be the fave after that. Thanks, it was almost as good as the time one of my sister in laws showed up wearing every gift our mother in law ever gave her. Are you in the Detroit area? Yes, I am. I know you from the fabric store. I love seeing your work and was pleased to find your blog. Wow! I love seeing older custom garments. There’s always so much to learn. Your dress is gorgeous – what a fantastic use of the skirt.